You are invited to Chico's Spring Preview Event! 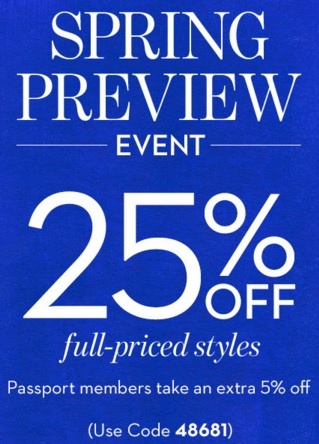 You have an unique chance to buy full-priced styles with 25% discounts! To receive the offer use printable coupon which is available through Chico's emailing. Passport members receive an extra 5% discount. You can also receive extra 40% discounts on selected already-reduced styles. Source of the information is Chico's . The offer is time limited. For more details visit your nearest Chico's store locations.